If you've been around my corner of the InterWebs for long, you probably know that the hubby and I (along with #WaltTheWienerDog) love our fair share of adventures. 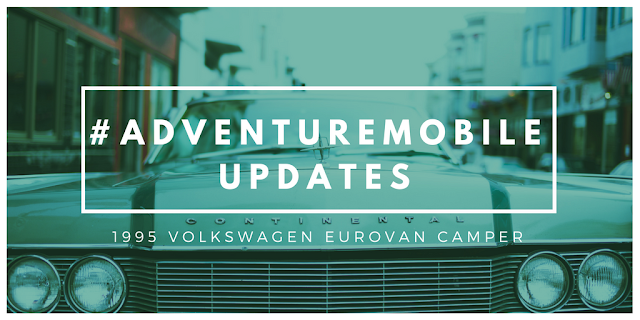 For the past couple years we had been using his Ford Ranger as our #AdventureMobile, but when the opportunity came up to purchase a 1995 Volkswagen EuroVan we popped on it. 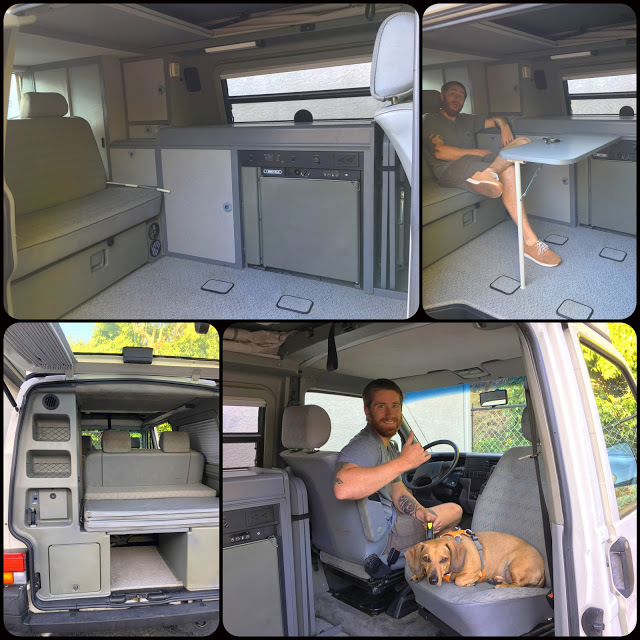 Since making the purchase in April, we have done some updates on the van and I thought I'd share some of the progress we've been making (we're pretty pumped on how it has come along... and how it feels more like "us"). This gives you an idea of what the interior looked like when we purchased it. Let me start off by saying that the hubby wants to try and keep everything as stock and original as possible. Any upgrades we do, we are keeping the integrity in mind (both for resale value and for the purest at heart). The back half of the van has a hard plastic (that is made to look like carpet) and the front part has carpet. 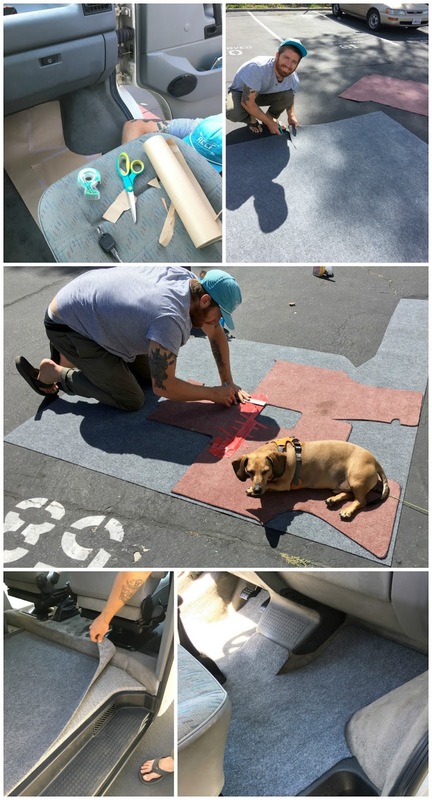 Although they do sell replacement Volkswagen carpet, it is pretty pricey ($125 for the front portion), so we thought we'd try our hand at some DIY replacement carpet. We ended up going to Home Depot and grabbing a large rug (4'x8') and a roll of paper. We used the paper (which is meant to be used more as a painting drop cloth) to create a template for the floor and then used that to trace the carpet areas. It made not have a VW logo on it, but our $22 investment is MONEY! We also added a rug in the back (which is an indoor/outdoor type rug so it is easy to shake out), but the carpet we added will protect the original stuff from getting ruined any further and keep it looking a little nicer. When we purchased the van, the back passenger side shade was broken (you couldn't open it to see out). We figured if we would be upgrading that one, we might as well upgrade them all. I'll be honest, I like the original ones better than the ones we got (the old ones opened vertically, so you could technically open/ close them partially vs. the horizontally opening ones we replaced them with), but at least they are now fully functioning. For being a 1995 automobile, there is very little rust or wear on the exterior of the van. There was a small area of rust under the passenger side door that we wanted to try and fix before it spread any further. The patch kit Ryan picked up seemed to be almost identical to surfboard repair kits, so he was very familiar with the process. Some resin, catalyst, fiberglass, sandpaper and spray paint and we were back in business. The old pop top was the original, canvas material. One of the back corners was all tore out and there were a few large holes in the mesh windows. We decided that we would upgrade the pop top to one of the nicer acrylic materials. Also, since we were upgrading, we figured we might as well add in a little personality and go with a bright color. The hubby and I decided on yellow and really love the way it came out. Although the installation process was a lot more intense than we were expecting (thankfully the hubby has some amazing friends who always seem to be willing to offer up their time), we were finally able to get it in. The replacement pop top was quite the investment (about $699), we believe it will be not only a statement piece but also last for a very, very long time! This was definitely a larger endeavor than we were expecting, but the guys did GREAT! And we love the pop of yellow! 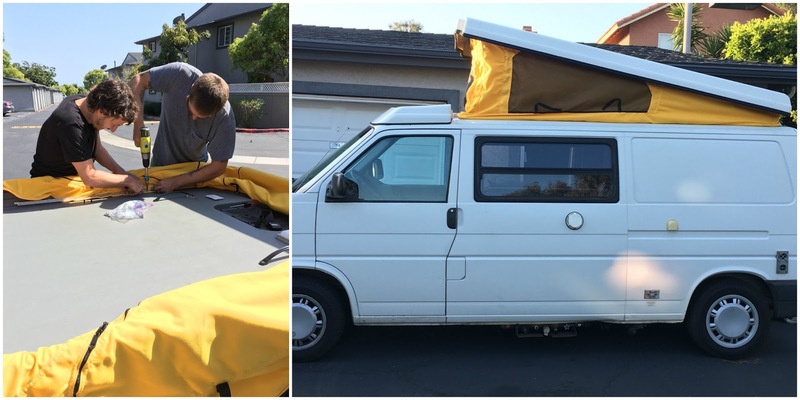 One of Ryan's friends wraps vehicles (think the ads you see on the side of cars, boats, buses, etc) for a living. When Ryan mentioned that we got the van, his friend offered to vinyl wrap the interior for us. Uh... HECK TO THE YES! Not only is it a way to keep the original plastic safe, but it is similar to painting a room and it gives it a MAJOR facelift. We had to go through and measure all of the surfaces we'd be covering so his friend could cut each piece specifically, but other than that it was pretty easy peasy (but that's probably because Justin did all the work and we just sat back and watched the makeover happen). Side note: the colors inside the van now match our master bedroom color scheme. The only real picture I have of the interior... oops! At least it gives you an idea of how it looks. 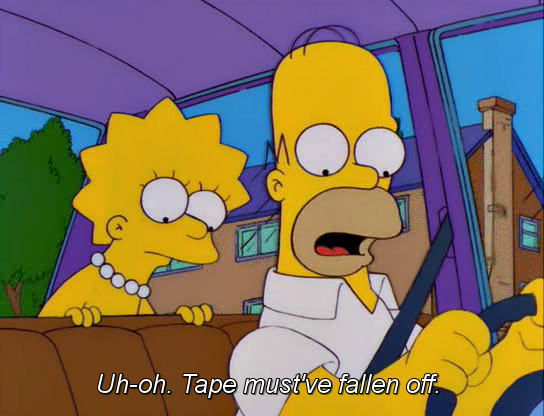 Currently, the van is over at the shop again. When we pulled in to Yosemite last week our friend said, "Now your van SOUNDS like a VW" and we cringed. One of the fans that cools the engine was making a funky noise (which we were assuming was due to all of the vertical climbing the van had to do to get into the park). We crossed our fingers, said some prayers and hoped that it would get us back home. On the way home all seemed okay until we encountered the perfect storm which is HELL-A LA where accidents and traffic delays, along with triple digit temps caused the van to start overheating. We would have to pull over and let it cool down for 30 minutes or so before trying to drive a few more miles (eventually having to take back roads because the freeway was too much stop-and-go for the engine to handle). When we got home it went to the shop and we were told that two of the fans were ka-poot. Another bummer part about this is that apparently those two parts are discontinued (remember, this model was only made for a limited number of years), so they are having a hard time tracking down any type of replacement... We're hoping this is not a sign of what is to come and once these "small" fixes have been made it'll be smooth sailing from here on out. What's an adventure mobile without a little adventure, right?! But Cherry looks sad, doesn't she?! 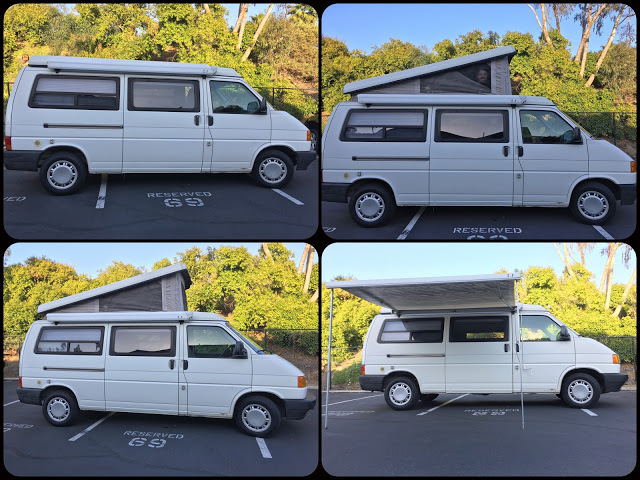 Although we've only had the van for about two months, we are really enjoying it (and hope to get it back soon so we can go on a couple more short trips in the upcoming weeks). The majority of the tweaks we wanted to make are complete (we may add some art, pillows, etc when we find things that call to us), and we are SUPER STOKED with everything! That interior vinyl looks really cool! Keeping my fingers crossed you get her fixed and running again soon! Looks like a lot of fun adventures to be had. Good luck with the mechanicals! Ryan and Neal are going to really like each other when you guys come for the marathon! I'm sending him this post right now! You've gotten a lot done.